Is there a difference between 6P models from Google Play and Huawei store? Asking because I was unable to order an 128 GB model from the Google Play Store, but had no problem ordering it from the Huawei store. It is the exact same phone, correct? And if so, shouldn't matter from where it's purchased, I hope. same phone. The 128 model has been sold out in google store. that's why you are not able to buy it. Thanks man. I'm OK with missing out on the credit though, still have about $120 worth of credit unused from gifts. Have you heard if they are honoring the play credit for phones *ordered* during the promo, but not shipped? where did you read that?? in the comment section?? "Purchase a Nexus 6P or a Nexus 5X by 10/25/2015 to get an email with a Google Play promotional credit once it ships. Redeem offer before 12/31/15." if the rule was to give it to people only if it ships before sep 25th then none of the nexus 6p users will get it. dont you think that google would have thought about that? "Promotional offer available while Nexus 6P and Nexus 5X supplies last, no rain checks. " It wasnt clear if "supplies" meant pre-orders (i.e. now that you can no longer order the 64 or 128 models) or if its just standard legalese to CYA. What taxes do you save? I already ordered a 32GB 6P from Playstore 2 weeks ago and taxes are $29.94 to GA, yet if I add one to the cart on Huawei's website, it's $33.29? LOL... I'm actually saving by ordering directly from Google. Is the tax savings a regional thing/your ship to address perhaps?? I think the tax varies by state. I'm in Indiana, so there is no tax for me, but a number of other states have tax. I'm fairly sure Huawei only has stores in Cali, but I could be wrong. 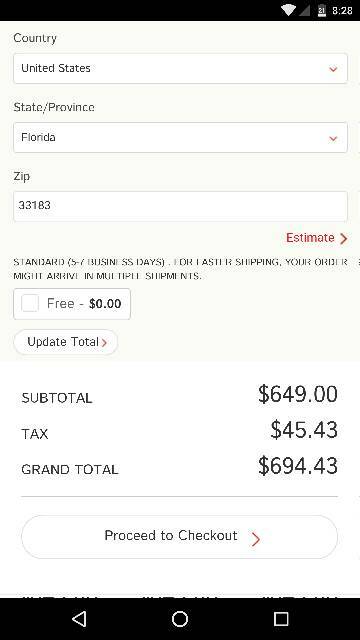 This is the reason for no tax elsewhere when buying from Huawei directly. Either way don't get mad at Huawei, the government is the one charging/enforcing sales tax. Jocelyn84 and maj71303 like this. I think their site is fine. But through Google you get that $50 Google Play card and Google's customer service is top notch in my few dealings with them. Per Google's site, they give you 15 days to return the phone. Anyone know if they give you 30 days for California, like some of the other sites I've heard doing?...Thought I read that Moto gave Californians 30 days vs their standard 15 day policy. Also, anyone have good or bad experience returning a phone bought from Google? Google wants you to love the devices and accessories that you buy from the Google Store. If you aren’t happy with something you bought, you can return an item within 15 calendar days after the day you received it. We’ll send a full refund (minus your original shipping & handling charges) to your original payment method within 14 business days after Google receives the device. Google support, they are great. I could elaborate if anyone cares to hear the rant but I'm stoked to be going back to google support and not having to deal with a retailer or OEM. still1 and Emperor like this. So far my experience with Google's support has been the opposite of yours. When I called to see when the 6p would be in stock again so I could take advantage of the $50 Play credit, I was told being on the waiting list was enough to qualify, which was confirmed by a second CSR. After a member on these forums was told it wouldn't, I called back and was told he was correct in that you have to have actually purchased a Nexus device to qualify. After that I called again when Huawei had the 128GB model in stock to see if it was possible to add Protect to it, but was told that you could only do so if you ordered it through the Google Store. I asked why since the devices are the same, and the ones they sell come from Huawei. I was told that buying a Nexus from another retailer means they won't be the same, since they could change the software, or in other words they could add bloatware to the device. In my experience, there is no difference in the Nexus devices bought from the OEM, Best Buy, or Amazon. If it were bought through a carrier, maybe, but neither the Nexus 5x or 6p are available through a carrier. They really need to get their people on the same page when dealing with customers, and that's one of my biggest problems with Verizon, put the same question to 6 different CSRs, and you'll get 6 different answers. Hopefully the reason is just because of the product launch and not a regular occurrence, but so far I'm not impressed. Let me clarify then, Google technical support is great. I wouldn't have very high expectations calling for sales support anywhere. I would be shocked if they let you get nexus protect on anything bought from anywhere except the google store, I wouldn't offer it if I were them either. I've never personally dealt with Huawei support but after dealing with Google support, Best Buy support, HTC support all in recent history, I would go Google in a heartbeat. My worst Google support experience is better than anything I've had from the other two. I honestly don't see the problem with offering support if bought from Huawei. That's where Google is getting their stock from, and offering Protect to non Google Store purchases is still revenue for them. I could understand maybe through Amazon or Best Buy, since they probably have their own warranty program that it would compete with. My main point was what the CSR told me, that buying from anywhere else means it may have bloatware installed which you wouldn't see going through the Google Store. I seriously doubt Huawei is going to do that for their own stock, and Amazon and Best Buy would have to physically open each device and add the software, that's just not going to happen. The only reason bloatware was on some carrier Nexus devices is because of an agreement made between Google and the carriers to allow the devices to be sold through the carriers. Devices like the Nexus 5x and 6p are sold unlocked and with no carrier involvement, so there is no chance you're going to see bloatware on them. As far as Google tech support, the only devices I have of theirs are a 2013 Nexus 7 and a Chromecast, neither of which has necessitated a call to them, since any issues I have had have been solved going through the various Android support forums. So until they get some devices back in stock and I actually get one, I'll have to take your word for it. is there a wireless charger that will let me to place Note 5 correctly even if I'm drunk as a skunk? How do I stop my phone from sending incoming directly to voice mail? How can a I delete a photo from my Note 5 but still keep it in my Google Drive?